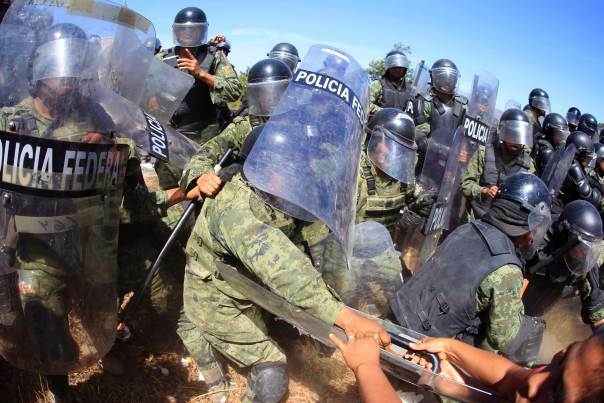 Confrontations with military police in Petaquillas, state of Guerrero, in Mexico on Feb 6, 2015. 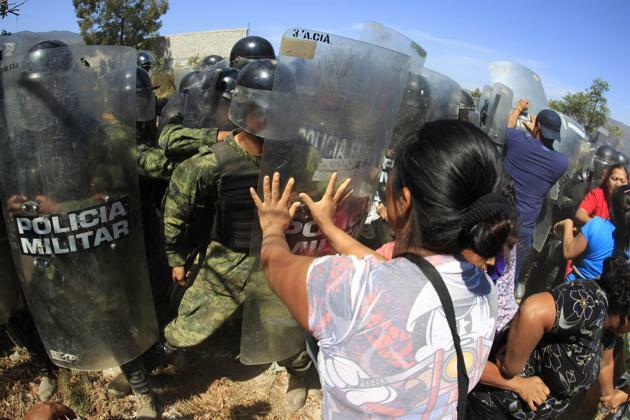 Villagers from Petaquillas, who support the presence of the Community Police of the FUSDEG (United Front for the Security and Development of the State of Guerrero), confronted military police during clashes in Petaquillas, on the outskirts of Chilpancingo, in the Mexican state of Guerrero, on February 6, 2015. They were protesting the arrest of two members of the community police. 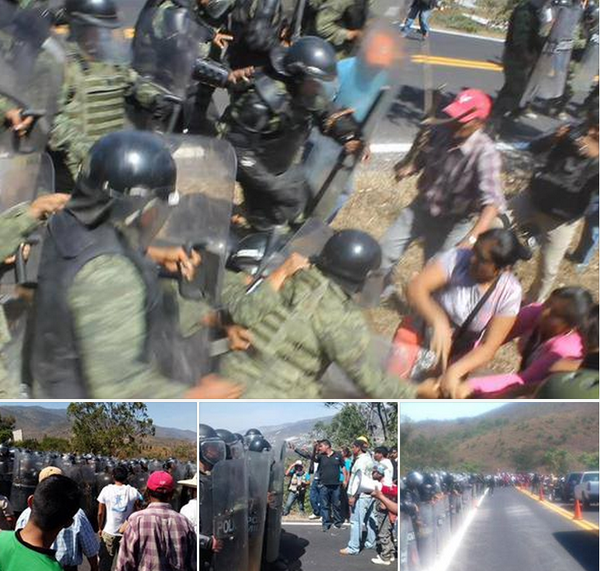 Some scenes from the confrontation in Petaquillas on Feb 6, 2015. 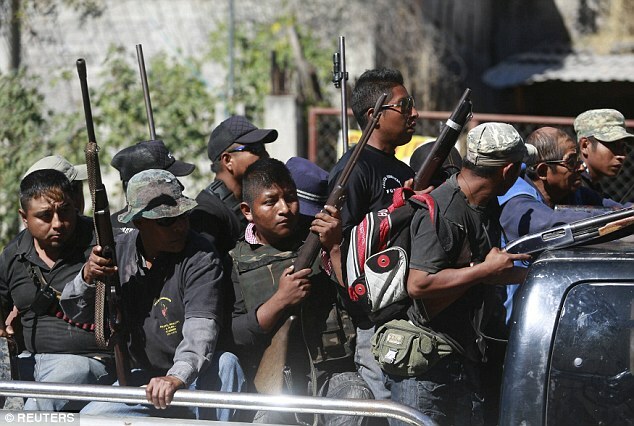 Approximately 500 members of the Community Police from the FUSDEG took control of the security of Petaquillas on the night of January 30, 2015, at the request of the people tired of the actions of organized crime, local media reported. Based on the traditional indigenous justice system, the Community Police is made up of volunteers from different communities of Guerrero, and was created in response to the spate of violence in several locations in the state. Resisting the military police on Feb 6, 2015 in Petaquillas. Vigilantes faced off with the Mexican army after they were asked by residents of a town terrorised by drug cartels to help them protect themselves. 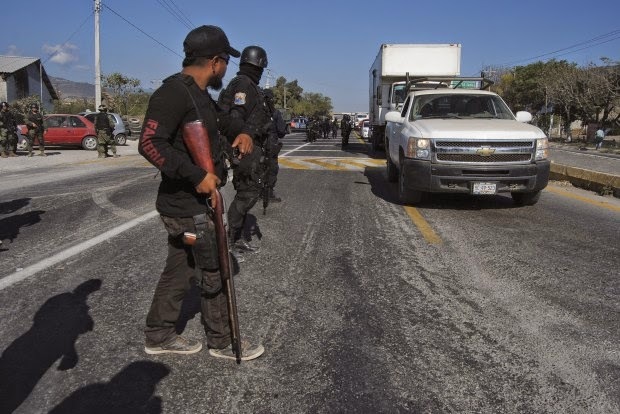 Hundreds of men armed mainly with shotguns, rifles and pistols entered a town near Chilpancingo, the capital of Mexico’s Guerrero state, after a wave of robberies, murders and extortion. 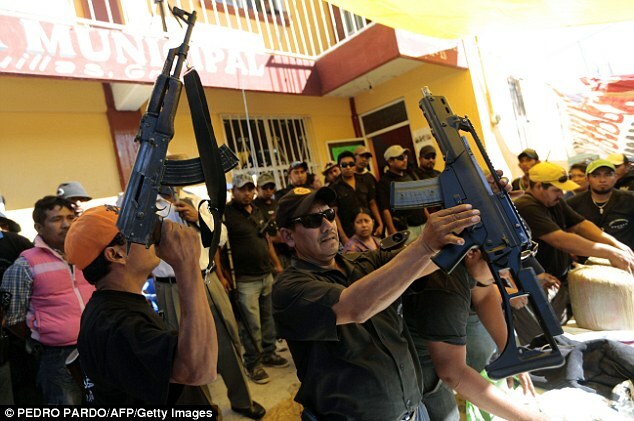 The vigilantes from the United Front for Security and Development in Guerrero State, or FUSDEG, had been invited by residents of Petaquillas, a community on the front line of a turf war between two powerful organised crime groups. Members of the community police at a check point, Feb 2015. But after they set up a checkpoint controlling access to Chilpancingo, around 200 soldiers rushed to the scene and threatened to disarm the community policemen, sparking a tense stand-off. Residents responded to the deployment of government troops by moving in with more trucks of their own, reinforcing the vigilantes and demanding the soldiers withdraw because ‘they have nothing to do here’. Army troops asked the vigilantes to withdraw to the communities where they are authorised to operate, but the FUSDEG members initially refused. Community police with two weapons seized from suspected gangsters. Soldiers prevented the community self-defense group members from setting up a checkpoint at the exit from Chilpancingo, but they were allowed to stay in Petaquillas, where residents voted to have FUSDEG provide security. Based on the traditional indigenous justice system, the FUSDEG community police is made up of volunteers and was created in response to the spate of violence in several locations in the state. Petaquillas Commissioner Arquímedes Vargas explained that his community had decided to work with FUSDEG because the federal and state government had failed to provide security in the town. ‘The security things have gotten out of hand, today the civil society has to intervene to guarantee what the government has been obligated to give,’ he was quoted as saying by Sin Embargo. Members of the community police in back of pick up truck. Petaquillas residents said during a rally that their town was plagued by crime. They elected 10 people to join their own local community police force, backed by FUSDEG. But a shouting match started when a group of nearly 150 people from neighbouring towns arrived in Petaquillas and said they opposed the vigilantes’ presence in the community. The Rojos and Ardillos gangs have been fighting for control of Petaquillas. One Petaquillas woman, Dona Silvia, said her home had been riddled with bullets after gangsters launched an attack on her neighbour’s house. She welled with tears as she said she feared losing one of her sons to a stray bullet. Another man said businesses are squeezed for cash by the extortionists, with protection money charged ranging from 1,000 pesos a week to 10,000 pesos a month. Since the FUSDEG community police moved in on Saturday morning they have swept through Petaquillas arresting suspects and seizing pounds of cannabis. The vigilante group, in operation for just more than a year, is made up of volunteers from different locations around Guerrero, and was created in response to the spate of violence in the state. Guerrero is the state where 43 Ayotzinapa Rural Normal School students disappeared on Sept. 26 at the hands of corrupt local officials on the payroll of the Guerreros Unidos drug cartel. Dozens of suspects, including police and public officials, have been arrested in connection with the education students’ disappearance. Posted on February 7, 2015, in Defending Territory and tagged community police, Community Self-defence, FUSDEG, Guerrero, Mexico, Mexico drug war, Petaquillas, United Front for Security and Development in Guerrero State. Bookmark the permalink. 1 Comment.